That just sounds scary, like a nightmare at the Dr’s. office. For the rock and roller in the family. I could have called it a pick box, but what’s the fun in that? Capacity 12 medium Fender 351’s. I used a piece of sheet steel as the lid, held in place by rare earth magnets. 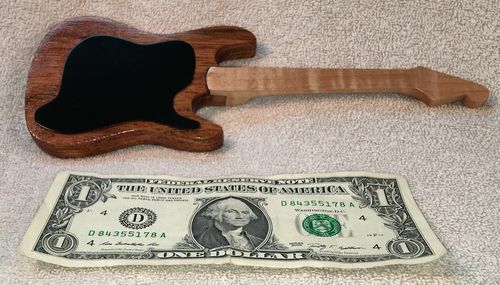 I thought I had some kind of mahogany when I started, but it is much heavier than the mahogany I am used to. I don’t know what it is. 8” long x 3” wide x 1/2” thick. ? and maple. Walnut plinth. Shellac. Yeah the title had me wondering do I look or will I be afraid after I do? I always thought a small box looked different, crazy nice hairy. Nice. A great way to keep picks. Rock on! Very nice work. A great solution to an obvious storage requirement and a elegant design too! Hairy, what a great, cotton-pickin’, plectrum pluckin’, pocket posing design. 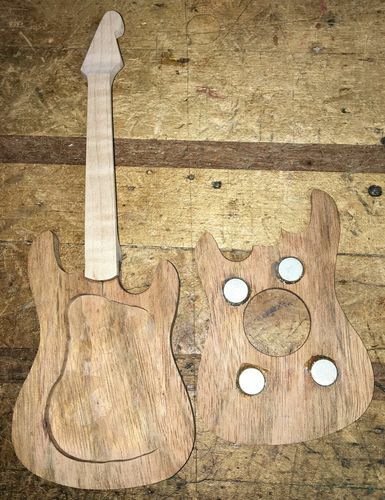 The guitar shape and choice of woods is very well done, Dude. Rock On! What’s not to like about this fun design? Keep boxing and keep posting. You tell him Boxguy! What a clever idea! !